Marc Bovet of BONE Structure has teamed up with Rick and Shawn Rondeau of Fourteen Estates to bring a new breed of home to Durham Region. He learned everything that he could about building a house, and he brought in one last builder. When all was said and done, after the learning and the extreme planning, Bovet wound up in a hotel room with his wife and children. Frustrated, Bovet realized that housing companies were stuck in a rut. He realized that he needed to look at housing from a consumer’s perspective. “I believe that 99.9 per cent of them have the right intention in the morning, it’s just that it’s not a unified process,” says Bovet. Bovet says that BONE Structure is not making houses for beauty’s sake, but with science backing everything they’re building. Bovet believes that the way houses are built in North America is outdated. He credits this with the overabundance of wood throughout the continent. He says that other countries have moved on from the wooden house, and yet Canada is still using the product, and being wasteful with it. “A typical house will run you 10, 12, 15 garbage containers,” says Bovet. However, he also notes that two identical houses could be built side by side, and they would not have the same amount of waste. According to Bovet, it is not an exact science. However, Bovet hopes that with the new method provided by BONE Structure, he and Fourteen Estates can begin to do away with such wastefulness. “We think BONE is the way of the future. The product is amazing,” says Rick. Where most houses use wood for the structure of their building, BONE Structure has started using steel in a way that Bovet compares to building a house out of Lego. The new houses are being built in Newtonville just off of Jones Avenue, and they chose the spot because it allows for them to make houses where there is a lot of space, and families who move in don’t need to be so close to their next-door neighbour. According to Shawn, Fourteen Estates purchased the land that they are building on three years ago, and they never considered building anything but houses there. According to Rick, the two companies came together due to an engineer who phoned him and said that he had seen the most amazing product in the world. “It is so efficient, so well put together, I think you should call this company,” the engineer told Rick. After looking at literature, Rick said that BONE Structure was the perfect storm. The formula that BONE Structure uses has also been patented in 42 countries according to Bovet. Because of the material that is used in building the homes, they are enabled to have large window openings, which will allow homeowners to take advantage of a largely forested setting. 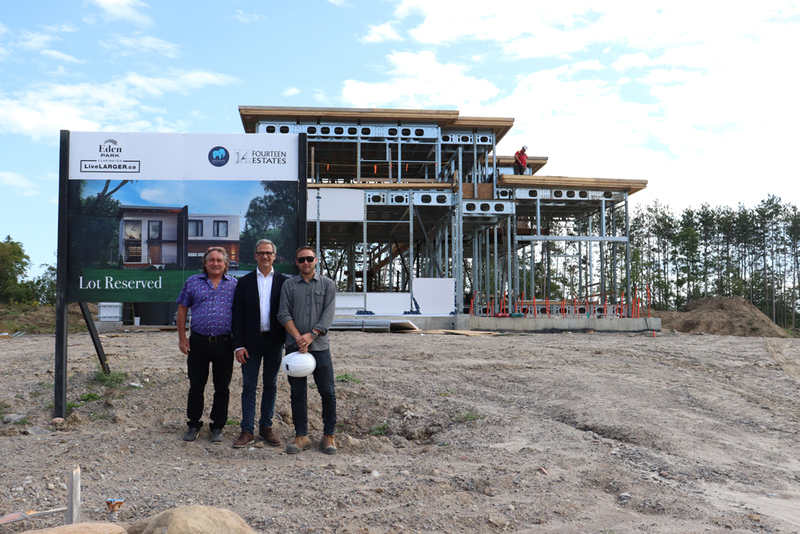 According to Bovet “housing has to change, and what we’re offering are significant benefits to the builders, and the visionary builders like Rick and Shawn, that have understood” that the way houses are built, and the materials that are used, needs to change. “There is no other country in the world that has not moved on to try to offer a better product that is durable, that is [environmentally responsible], that enables people and future generations to adapt the home,” says Bovet. Bovet says that they do not have garbage containers on their job sites, and the reason he gives is that he believes the money should go into the house, and not the garbage. Bovet also emphasizes that the houses have an adaptable structure. They can be modified from the inside and the outside of the house at anytime. According to Bovet, the structure of BONE houses is assembled with battery pack drills, and there is no cutting, piercing or waste. Bovet says that BONE Structure is winning awards in California, and has even been called one of the top 50 innovators along with other entrepreneurs such as Elon Musk of Tesla and SpaceX fame. “He picked us because of the integrity of our company and the quality of our work,” Rick says of the partnership. According to Shawn, there are 28 houses going in during the first phase, and there will be another 12 at the south end, which will be ready in approximately two years. People will begin moving in just before Christmas says Shawn, but not all of the houses will be done by that time.